ABFE is at the center of a movement that inspires grantmaking entities, philanthropic individuals and nonprofits in the US to work collectively towards a brighter future for Black communities and the country as a whole. 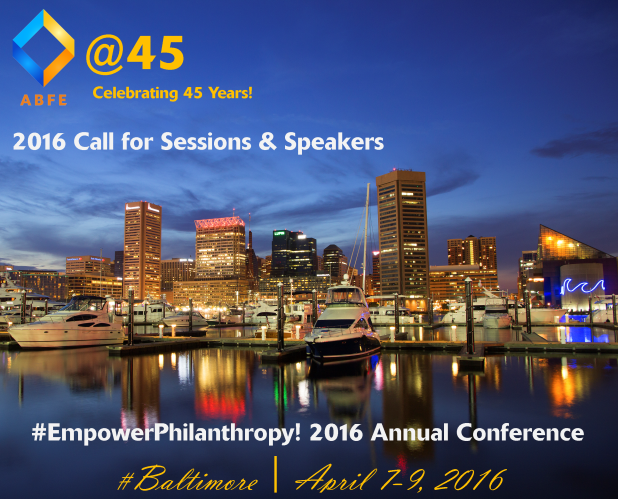 In 2016, ABFE will commemorate 45 years of advocacy and service for promoting effective and responsive philanthropy in Black communities on April 7 – 9, 2016. The theme is “Empower Philanthropy! Celebrating 45 Years! 2016 Annual Conference Presented by ABFE: A Philanthropic Partnership for Black Communities." As an organization, it is our responsibility to raise awareness that together we can empower philanthropy by shifting from power to action as a unified and strategic force that moves investments to Black communities. Since ABFE’s founding in 1971, generations of members have served philanthropy by demonstrating a commitment to advocate, coupled with a fighting spirit that raises continued visibility to direct more investments to our community. Because of this, ABFE has become a national institution that reflects and reinforces the spirit central to a movement that improves Black communities. Thus, the reason for hosting the conference in the great City of Baltimore. Assemble thought leaders, key organizations and coalitions that share strategic investment practices and effective programs for Black communities. Connecting people to conditions that matter in Black communities throughout the African diaspora! We invite you to submit a proposal for a session presentation to be offered at our 2016 conference. We encourage innovative and creative presentations that are grounded and aligned with ABFE’s Responsive Philanthropy in Black Communities (RPBC) Framework and defining characteristics. Topic areas could include, but aren't limited to ABFE Black Fact Sheet topics, including: Education, Criminal Justice, Employment, Workforce Development and Entreprenuership, Health and Wellness, Wealth and Asset Building. Community Organizing and Constituency Engagement: Philanthropy builds the power of, and invests in, the people who are most impacted by the issue. Policy Change, System Reform and Program Delivery: Philanthropy focuses on influencing the root causes of disparities to primarily include the federal, state and local policies and program practices and regulations that disproportionately and adversely impact Black communities. Research/Data: Philanthropy is built on, and supports activities to compile, data sets disaggregated by race to inform how the Black community fares. Communications: Philanthropy minimizes the dominance of negative images in Black communities. Complete the application questionnaire in the link below. Connect your idea to one or more of the five (5) RPBC Framework and defining characteristics – Constituency Engagement; Policy Change, System Reform and Program Delivery; Leadership and Infrastructure in Black Communities; Research/Data; and Communications. There are 10 spaces available for workshop sessions. These 90-minute sessions will provide opportunities for knowledge transfer, skills development and collaborative learning related to empowering the Black community. We encourage you to be creative, innovative, and interactive with your session idea. Be prepared for us to pair you up with other applicants who may have similar ideas. All presenters will be required to participate in at least one 45-minute prep call prior to the conference. Session-only. You will have access to your session only (No fee). Day Pass. You will have access to all conference programming and activities for the day of your session-only ($250). Full Conference Access. You will have access to all conference programming and activities during the entire conference ($400). The ABFE Staff will review all workshop proposals. Because we anticipate far more proposals than available workshop sessions, please note that we will need to combine some proposals with others. Not every proposal can be included in the conference agenda. The deadline for submitting proposals is Wednesday, November 25, 2015. The ABFE Staff will notify you of the status of your proposal on or before Friday, December 18, 2015. For additional information or technical assistance with submitting this form, please contact Special Gathering at abfe@aspecialgathering.com or call (410) 685-7664. Click on the "next" button to complete the following questionnaire. For additional information or technical assistance with submitting this form, please contact Special Gathering, ABFE's Event Management Firm at abfe@aspecialgathering.com or call (410) 685-7664. We are requesting at least two presenters for each session. Please provide info on all presentation members. Please upload a high resolution photo for conference materials in a JPEG file format. Are you an ABFE Member? Session titles are like newspaper headlines; they should clearly illustrate your idea. Your workshop title describes the attributes of attending and summarize the main point of your session. Consider writing the title after identifying the workshop description/summary and learning objectives. Keep your proposed workshop title short (10 words or less). The workshop description provides an overview of the session. Good descriptions raise interest and generate excitement about the session. To write an engaging workshop description with 200 words or less, remember, the best proposals are clear, concise and easy to read and understand. Before getting started, consider preparing a list of the benefits of attending the session you are proposing. Narrow the description to one paragraph and focus on three important points. The description should be aligned with one or more of the ABFE RPBC Framework Tenants for Black Communities. Always define any acronym at first reference. This serves as a reminder that voices from cross section roles can diversify and expand the presentations. And finally, keep it simple. For your convenience and for ease of sorting, we have provided a list of issue areas and RPBC defining characteristics to choose from. We also provided an “other” category for those topics that do not neatly fit into a prescribed subject area but are pertinent, nonetheless. While most sessions have one distinct subject area, up to three areas can be selected from each of the drop-down list. This section is very important as it will allow the ABFE Staff to strategically narrow down the topics to ensure core issue areas and RPBC tenants are covered in the conference agenda. A learning objective establishes what session attendees should be familiar with or able to do by the end of the session. Please prepare up to three (3) learning objectives. A learning objective makes clear the intended learning outcome. Valuable learning objectives focus on the application and integration of the knowledge and skills attained. A demonstration format explains how to do something or how something works with the use of visual aids or objects. Fishbowls involve a small group of people (usually 5-8) seated in a circle, having a conversation in full view of a larger group of listeners. Fishbowl processes provide a creative way to include all workshop attendees in a small group discussion. Fishbowls are useful for ventilating “hot topics” or sharing ideas or information from a variety of perspectives. More often, one or more chairs are open to “visitors” (i.e., members of the audience) who want to ask questions or make comments. Although largely self-organizing, the fishbowl process usually has a facilitator or moderator who starts the discussion. The fishbowl is almost always part of a larger process of dialogue and deliberation. The panel format usually involves up to five panelists (including the moderator) commenting on a specific topic or issue in a discussion led by a moderator. Ignite presentations use 20 PowerPoint slides that automatically advance every 15 seconds for a total presentation time of just 5 minutes. Ignite slides tend to incorporate excellence in slide design in support of a very clearly articulated message. Important Note: What does an Ignite session look like? Ignite presentations will be grouped into sets on a common general theme, such as ‘education, health, criminal justice, or a new methodology, etc. During the session, a moderator briefly introduces each presentation and the presentations are given in rapid succession, one following another. At the end, time is set aside for connecting with individual presenters, but there is not a formal question and answer portion of the session. With some presentations akin to a performance, and recognizing that for many the format is a new one, audiences often applaud and support those who rise to the occasion. Storytelling is a popular concept in data analysis. Share various communication tools (video, social media, blogs, etc.) used for delivering data and information that is creative, persuasive and innovative. The "World Café" is a structured conversational process intended to facilitate open and intimate discussion, and link ideas within a larger group to access the "collective intelligence" or collective wisdom in the room. For additional information or technical assistance with submitting this form, please contact Special Gathering, ABFE’s Event Management Firm at abfe@aspecialgathering.com or call (410) 685-7664. The Team ABFE will contact you on or before Friday, December 18, 2015 regarding the status of your proposal.